Mr Gronsky I would like to start our conversation from asking you about a definition of your work. How would you call yourself? First of all, I am not an art critic, so giving sharp and solid definitions is not something I am good at. In two words, yes, I am interested in what can be called psychological landscape photography. I tend to be alone for long periods of time, walking around in search for places that are invisible for most people, but give me a strange feeling that makes me pay attention. All these places are formed by man’s presence, or manifested absence. These pictures are un-picturesque, they are about the viewer, his/her attitude, not a given place. The viewer is invited to take part in making out the sense. I am looking for something very general that may make the viewer feel it as personal. It seems to me that the landscape photography through the last two decades has become one of the most influential and present topics for photography. What has happened that Robert’s Capa statement to be as close as it is possible become irrelevant? Current-day landscape photography is a form of contemporary art, it is not telling stories or entertaining, but discussing social, political, economical topics. Capa was a journalist and his goal was to cover a situation as good as possible. Through his humanism and creativity he has aspired to levels where few before him could. This attitude still exists in the best photo journalism works. Look at Yuri Kozyrev or Stanley Greene. In the interview with Joerg Colberg you’ve mentioned Stephane Shore as one of your inspirations. It is easy to see that through the way how you compose your images, how the viewer is driven by the lines and how clear are those images. Works by Shore strongly defined the image of new American landscape, also by undermining the earlier black & white vision. Do you also feel as you would be redefining new Russian landscape through your work? I am not aimed to redefine something like a Russian landscape. I am not sure. What is a Russian landscape in photography? Something done by the amateur photographers in the 1960-ies? Then, the main idea was a retreat into nature’s unspoiled beauty, as untouched by politics. Or is Russian landscape something done by the press photographers during the Soviet years? These were professionally optimistic and mainly made staged photography. I do not have a lot of common with any them, I do not follow nor confront these works, they simply lay in the other part of photographical universe for me. What was tremendous about people like Shore or Eggleston, is their expressed determination to follow the everyday, the mundane, at the same time employing the up-to-date contemporary art visuals. Many of those photographic landscapes that are now so explored as a subject are also treated as political once. In a way they are almost sociological or even demiurgic, giving us the wider picture by showing relations, interactions, groups of people as marks or parts of systems. Are you looking for something like it with your work? I look to find how the world changes. I want to see something that is ugly now, that we will call “beauty” in due time, and yet later, commonplace. It is the most neglected, the most everyday, where the roots of change sprout from. I am very much interested of the notion of the border – where two different systems of life clash – and in the ensuing chaos: visual, social, or other. It is this scar tissue where the new systems are conceived. How would you describe the image of Russia today? In a visual sense. Russia is visually under-explored. My own description would involve vast expanses where an individual is not discernable. Russia is generally “cold”, and communication between individuals is difficult. But this perception is so personal. It is not Russia that I take pictures of, it is more like Russia has a lot of what interests me, serves my goals. I am not aiming at becoming a Russia’s visual definer. Your project Pastoral is based on the idea of exploring places which are in between – nor urban nor rural. I remember when talking with Mark Power about his work Two Song Melody which was a project about Poland that he was also looking for such places. He argued that those are the places without the image, they do not have visual representation and in the final effect for a common Pole they do not exist. Would you agree that by your work they also become visible and existing? And if so what those it mean for a common Russian? It is not the only project where I explore a border, a no-one’s land. Generally, all my projects touch this notion. These places may get their own visual representation through my works, but that is not the main goal. I look for common that looks beautiful to me and estrange it out of the context with a frame. For a common Russian these places are blank and chaotic. “That is a view from my window!” say many, meaning that is a bad thing. But that is the whole point! The viewers are appropriating. It is exactly life that goes outside the window and that is so difficult to define. In many of your images the landscape is a scene for a compromise between nature and industrialization. Blocks, city itself coexists there with forests, rivers and lakes. Do you see it as a balanced situation or rather it is a silent conflict in which people living there are in between? Or maybe those images, how they are composed show that it is impossible to get away from the industrial background? Definitely there is a conflict. But I don’t see nature as “good” or city as “bad”, more that they interfere and affect each other, and afterwards it is not a normal city or a normal piece of nature but a strange juxtaposition. What is more, people’s behavior is altered. People would cling to any piece of dirt bank to make barbecue and imagine they are in the woods, but they are not. And vice versa, these high-rise apartment buildings would offer the middle-class inhabitants ideas of “city comfort”, but the buildings are in the middle of something else, not a city. It is the situation of duality where we humans show ourselves and our habits. My view may be called antopological in this sense. In already mentioned conversation with Mr Colberg you talk about very common for Russians feeling of vastness. Could you elaborate about it? Does it change the photography in Russia? It is difficult to say, by luck I am one of the well-traveled artists, I have seen many god-forsaken places, and everywhere I was finding the same, which proved my point. All my projects have been made in Russia or China due to the attitude, common for the both countries: an individual is nothing in the face of history and/or space. Is this feeling common to all Russian artists? I have no idea, but probably not. Your work The edge is focused on boundaries, the limits of the Moscow city. What defines the boundaries for you? What happens there? And how the point of view is changing? Boundaries are the most difficult thing to define, but we can always define “here” and “there”, and then start to move from “here” to “there” asking ourselves all the time: are we there yet? This feeling is yet more difficult to catch or express. And as I have said, all kinds of things happen in between. The more you look the more you find, you don’t have to go far. You can actually find a border right under your feet, and this crack in reality’s tissue may swallow you. Is it difficult today to find places you could call edges? Technically, no. 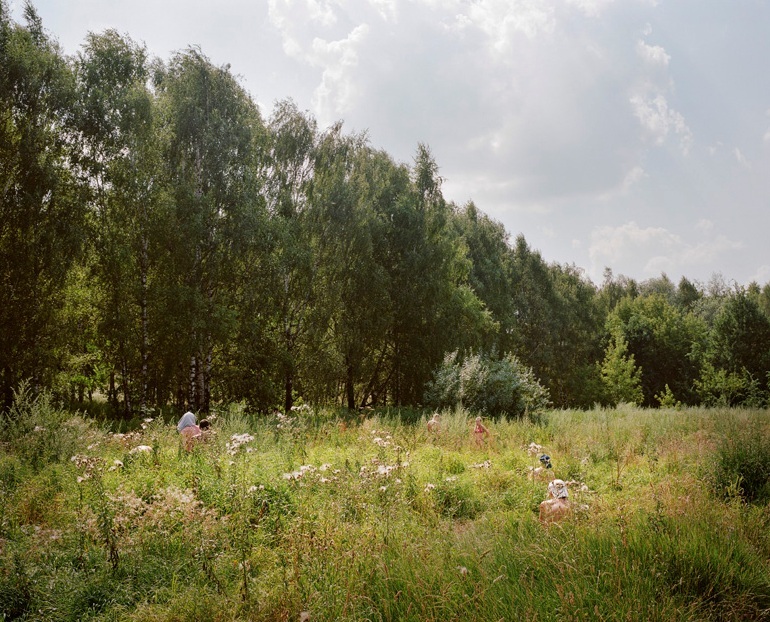 Depends on a given project, but for example my “Pastoral” series was all shot in the suburbs of Moscow. But it is months and months of exploration before you can express it all in one shot. You have to love to walk and to be alone with a camera and wait and listen and never be in a hurry. That’s what I like a lot. Are you also interested in the city itself? If not, why? What would have to take place in the city (or what could you find there) to become interesting for you? I have lots of interests as a person, I live in a city, and I don’t normally go hiking. Generally speaking, I am interested in the duality of what we see and take for granted, this film of normality is quite thin, actually. But as time goes I might have other interests, we’ll have to wait and see. Do you see yourself as influenced by history of Russian photography in anyway? Not really. The history of Russian photography is an interrupted line. We had pre-revolution photographers who have left. We had constructivists who have been repressed. We had the war photography that was all staged. We had the so-called “amateur photography” and “official photography” after the 2nd World War that do not interest me much. I would say that my roots are with the constructivist photography, but on the negative side: I try hard not to do that kind of obvious geometric beauty, or else I play with it. Most of my influences are from the international photography, I was born in Tallinn in 1980 so the iron curtain was never a problem, nor the Russin photography history an inspiration. In the conversation published in Foam Magazine, you’ve said that Russia’s visual variety is a bit of illusion. Do you think that this illusion comes from still treating Russia as an exotic a little bit unknown country? I have meant that you find the same things everywhere. Probably many photographers might argue that there are mountains here and rivers there and all kinds of other things in Russia, but I am only interested in landscape as a psychological reflection of a man, and this reflection I find surprisingly similar everywhere in Russia. Yes Russia is under-photographed in general, in editorial or sociological sense, but that fullness of representation is something I don’t care for. How do you prepare your images? Do you compose them as Andreas Gursky from a group of shots and finalize the scene with photoshop and other tools? In your journeys do you look for loneliness or a state where the need to define things go away? In Less than 1 it seems like you would like to find the space without others, without culture, simply empty. I do not prepare my images much, some colour-correction and other technical improvements maybe. All images go as a whole, like shot. This is not a collage. In my journeys I look for places that express me right. “Less then 1” was also a border exploration – a border between inhabited and un-inhabited. These are places where density of population is less than ove person per square kilometer. The ‘less than 1” person is something dissapearing. So I was looking for that person and it’s traces. Coming back to Shore, his works are of those which started for photography this new dialog with painting. Is there a difference for you in the attitude presented by the viewer of photography and painting? If so, which one is closer to you? Photography is good enough for me, otherwise I wouldn’t have been doing it. We can safely assume that photography as a medium has its own special qualities, which may be beneficial for an artist (thre technical creation of an image, the argumant around “real” and “fake”, athe possibility to deceive, and others). That is why photography is widely used by acclaimed artists such as Gursky, Prince, Strut, Sherman, and others. I would say that photography as a medium is long since part of contemporary art, but there is also the traditional world of art photography that exists since late 60-ies and is merging with contemporary art right now. In general are you interested in creating with your images visual representation of contemporary Russian landscape or rather they should be treated as the essence? I’m asking about it because of the strong feeling that I get when looking at your works. I feel like the time is something you are not interested in. Your works seem as they would be rather abstracts, cut away from the categories of past, present and future. What is the base of this approach? As I have said, I am not trying to visualise Russia. I hope my works are an essense, but of the relations and atitudes that I study, not of Russia in general. I don’t think a lot about time. I have done a lot of photojournalism and I understand the immediate, the need to be fast and tell the story, but what I do as an artist is meditative. Through the attitude of the artist, all art tells about the time when it has been created, so in this case I hope it is the matter with my works, too. As a photographer you can influence with your work the way how people see and the quality of visual culture. How would you describe the quality of it in Russia? The quality of visual culture is extremely low, in general. Not only in Russia, you can find it literally everywherre. But that “low” is what turns me on! It is at the same time alive and thriving. I am not a teacher nor being satyric. I am geniunelly in love with my subjects. As for many other artists, for me it is boring to search for what has been found before. My pictures are my personal search and exploration.